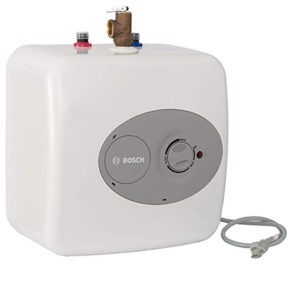 Tankless water heater as a frequently used daily residential machine, can be well used for either large home or tiny home with different flow rates and types. Small or tiny studios are lack of enough space for a large heater especially for tank heater, therefore, we would like to suggest several best tankless water heaters for tiny house for you. It weights light and is designed as compact small shape, so it is the perfect one for small tiny studio use. You can install it near the point of use and fast heating performance supplies constantly hot water in a few seconds. It takes about 15 seconds for hot water flowing to hand sink. It is super easy to install all by yourself, takes about 1 hour to hook it up. The multiple stranded wire makes connection much easier. The maximum flow rate of the unit reaches up to 4 gallons per minute. With delicate design, the water temperature stays the same even when used for long period. Led light and digital temperature settings make it easy to operate and adjust the exact water temperature you want. The temperature of water shows on the screen and can be adjusted one degree a time accurately. Temperature lights up once you turn on the valve and error codes also shows on for reminding. It is equipped with self modulation system to adjust the power when hot water demand is high. Compared with RTEX-13 series, this unit is more powerful but is also a bit larger than that. It works smooth and quiet, no working noise can be heard and no clicking relays either. But the waiting time for hot water is a bit long, takes about 40 or 50 minutes for hot water to flow. 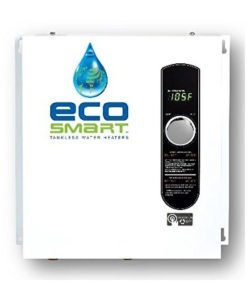 It is designed super light and small, it is regarded as the lightest and smallest one in the full lines of EcoSmart tankless water heaters. After installation, it is said to save 12 cubic feet and thus can be perfectly used for best tankless water heater for small house. There is digital control system for you to operate the heating machine easily, you can adjust water temperature up and down with one increment to find the exact temperature you want. Self modulating technology enables the heater to draw energy only when you use it, and well internal design helps you save about 50% in water heating cost. It is able to process up to 3 gpm in cold areas and 6 gpm in warm places. 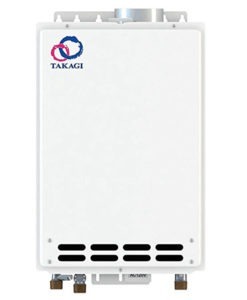 This unit is the lightest and smallest among all the Takagi lines of products, it saves much space for your home and you can easily hook it up anywhere in your home. It is also easy to be installed, takes about few hours to hook it up by yourself. The flow rate of the unit reaches 6.6 gallons per minute, it is able to supply constantly hot water for multiple bathrooms and kitchen faucets the same time. But when used in cold regions, the flow rate may drop to 3-5 gallons per minute. Maximum temperature of it is up to 150 degrees F, capable of meeting the demand of daily residential use. It demands a power input of up to 140000 BTU per hour. Thermal efficiency is 0.81. It is not powerful enough to meet the demand of large house use, but is a perfect one for small home or point of use. Flow rate range of it is between 0.6 and 4.8 gallons per minute, and gas rate is between 25000 and 80000 BTU per hour. It supports one bathroom and one kitchen faucet uses the same time. It has automatic temperature control to prevent overheat and keep water temperature stable, energy saving mode is adjustable for save energy, there is alos child lock technology to avoid unintentionally adjusting. It needs to plug into standard 110v electrical outlet with UL-listed cord, electronic ignition system makes it safer in using process. Sleek modern design with easy operated LED display control give you best enjoyment on using. The maximum flow rate of it is 3.6 gallons per minute, self modulation system makes it activates only when you use it, thus it saves much energy. You need to get ventilation facilities for safety using. It is able to support one bathroom use only but constantly hot water offers. 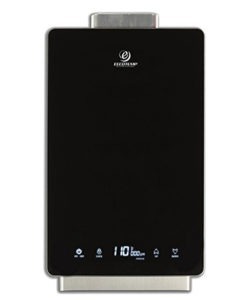 The unit is extremely light and you can easily hook it up anywhere you want. Stylish compact shape saves much wall space for tiny house. It is easy to read digital temperature display, but is quite hard to adjust exact temperature you want. The same as Eccotemp i12-LP one we recommended before, this unit also adopts electronic ignition system, you need to plug it into standard 120v electrical outlet with UL-listed cord. It weights only 17 pounds so you can install it anywhere you want, it is also able to be installed point of use. The small footprint saves much space for you. The installation is also easy and straight forward, anyone who knows about basic knowledge can hook it up under clear instruction. Temperature range of the unit is between 90 and 135 degrees F, you can set water temperature in increment of 1 degree each time. It is also capable of automatically detecting water flow by turning it on and off by itself, thus eliminates wasted water flow and lower water consumption greatly. 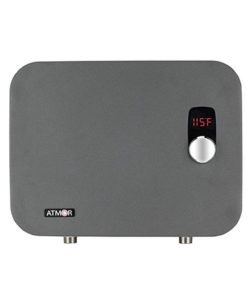 It is said to save 50% on electricity bill, Atmor’s advanced ThermoPro self modulating system is adopted to regulate the amount of energy required to heat water. 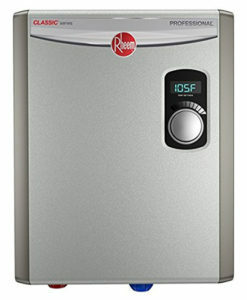 This unit is a point of use tankless water heater, and can be used for kitchen faucet or bathroom sink only. It is able to be wall hung or floor mounted, the waiting time of hot water is super short, takes about 1 second. 2.5 gallons per minute water flow enables to supply constantly hot water for you. But because of its small power, it lacks of consistency on water temperature. It is super small, and can hide under water sink easily. For fast and large amount of hot water, we suggest it to be installed near where you intend to use hot water. The operation of it is also simple, no complicated machinery is added, you need only plug it into the outlet. 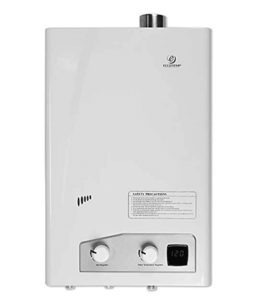 There are some common features of best tankless water heaters for small house, when you choose, you can combine the features together and see which one suits your family most. Of course the primary feature of tankless water heater for tiny house is the small shape. Owning a tiny house, there will be less space for you to install a large one on the wall. The small and compact shape is able to save large amount of space for your home. Some of which can even be installed under water sink. As there will be only one or two bathrooms for tiny house, the tankless water heater do not need to get such large flow rate, it needs only meet the demand of one bathroom and one sink use the same time. The small flow rate also helps save much energy and heating costs for you. Most of tankless water heaters for tiny house are suggested to be installed near the application fixture, it needs only to supply hot water for one bathroom use, thus installing in the bathroom helps reduce the waiting time for hot water, and less cold water is wasted accordingly. Compared with large home types, tankless water heater for tiny house owns shorter waiting time. The pipe is short and thus it takes only a few seconds for hot water to flow through pipe line to destination. If you intend to reduce waiting time and quickly get heated water, you’d better install it near application fixture. And remember to keep machine dry all the time, install it within safe distance from water for safety. Three types of tankless water heaters are frequently known to us, which includes electric type, propane type and natural gas types when divide according to the power source. Electric tankless water heater is frequently used for small tiny house, it weights light and is normally designed into compact shape. The flow rate and power rate are normally low, meeting the basic demand of tiny house single bathroom use. Natural gas and propane tankless water heaters are basically the same, they are more frequently used for large family, owning large flow rate and power, they are capable of providing constantly hot water for multiple bathrooms use. Some of the recommended best tankless water heaters for tiny house with natural gas or propane power can also be used for large family. Besides, there are also point of use tankless water heater or under sink tankless water heater. Majority of heating machines are mounted on the wall because of their large shape, but under sink type is normally installed under hand sink, the flow rate of it is super low, meeting the demand of single sink use only. Therefore, if you intend to get one for hand sink, you may consider the under sink heaters. 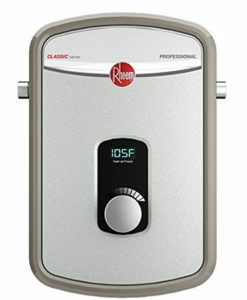 Among all the best tankless water heaters for tiny house, we would like to suggest Rheem RTEX-13 Tankless Water Heater for you, it is the hot selling type on tankless water heater market of 2019. This one weights light and has 4 gpm flow rate, thus is capable of providing constantly hot water for bathroom and sink use. The waiting time for hot water is only 15 minutes. The delicate design makes it easy to operate and adjust the exact water temperature you want. Water temperature always stay the same. If you have interest in such item, please feel free to check more information or product price details on Amazon, the constant discount on Amazon is also helpful for saving large sum of money for you.